Life has a way of keeping us on our toes. Whether it’s a career change, an addition to the family, a new relationship status, or a step into a new chapter of life, there are always changes happening. New Jobs and Company Transfers: Without a doubt, business is booming in the Southwest. Dozens of Fortune 500 companies are bringing their corporate offices to places like Fort Worth and Houston. Low property and business taxes are drawing both established and start-up businesses to Phoenix. These areas are becoming hubs for industries like healthcare, energy, transportation, telecommunications, and more. The expansion means hundreds of jobs, which in turn means hundreds of transplants to the area from all over the country. Outdoor Living and Adventures: Both the weather and the wide-open spaces draw adventurers to these areas. Since places like Phoenix, Houston, and Fort Worth offer mostly sunny days throughout the year, they can support the outdoor lifestyles of those looking to explore state parks, lakes, rivers, and forests in these states. Active Arizonans and Texans can find themselves enjoying this weather by being on the water, in the mountains, on the miles of bike and hiking trails, and more. Economy: Phoenix, Houston, and Fort Worth have booming housing environments and economic climates. Costs are comparatively low for housing, transportation, energy, and entertainment. The low cost of living overall is one of the biggest reasons people are moving in droves to these areas. Retirement: For all of these reasons, Arizona and Texas are still some of the most popular places to retire. The hundreds of retirement communities make independence and adventure possible for even those who are in their later years. More retirees than ever are deciding to relocate and they are going mostly to areas like Phoenix, Houston, and Fort Worth. Big life changes are happening in the Southwest, and we’ve got storage unit solutions all through Phoenix, Houston, and Fort Worth that are supporting those changes. Our customers are finding just how helpful a self-storage unit can be through one of these major transitions. We’ve put together a list of some of the most common ways that a self-storage unit can help at these times. They take the pressure off: Most people are pleasantly surprised at how much easier a transition is with a self-storage unit. It’s common for there to be a gap in time between arriving in the new area and starting the new job, between selling the home and buying the new one, or between arriving and waiting for the apartment to be cleaned. Self-storage can be a huge help in these situations. Prior to your arrival in the new city, you can call or research online to find the most convenient storage unit facility to your location. Upon arrival, simply unload there and have peace of mind in the upcoming days of signing papers, meeting new colleagues, and settling into your new digs. A storage unit buys you all the time you need to gradually move things in on a schedule that makes the most sense for your situation. Extra space means room to move: When moving, it becomes quickly apparent that space to move is necessary. Stacking and restacking boxes in small, cramped spaces gets old really fast. A storage unit, which you can rent in any size to match the home you are leaving, gives you the space to unload your belongings out of the way of your new living space and not have to maneuver around them through the unpacking process. You need not bother with the boxes of books until you are good and ready to stack them on the shelves in your new home office. For families, having a storage unit for their stacks of boxes may be the safest way to make their move. Having an uncluttered space to unpack boxes over time can keep little ones from any safety concerns. Find options to meet any need: Whether you are moving to a new home or opening up a new business location, you will find a storage facility that meets your needs with Bargain Storage. Storage units are most often grouped by how many rooms worth of goods they hold. There is no need to secure a self-storage unit that is larger than what you need. If you are only moving an apartment’s worth, you may only need a 10 x 15 space during your transition. For those moving from larger homes, a 10 x 20 or 10 x 30 unit may be more suitable. Need to store your vehicle, RV, or boat? Look for a Bargain Storage facility that offers these types of parking spaces in the Phoenix, Houston or Fort Worth areas. Our storage company makes your rental process easy with prices lower than local competitors, month-to-month rentals, no hidden fees and honest, friendly service. Once-in-a-lifetime transitions can be fun: These big life changes should be celebrated and enjoyable! A storage units can help you eliminate stress and take your time through it all, so you don’t miss any of the good memories to be had. 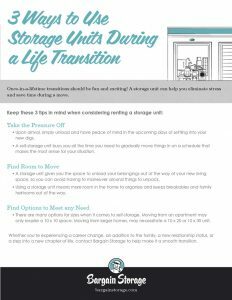 Check out our handy checklist for making big life changes with the help of a storage solution from Bargain Storage!